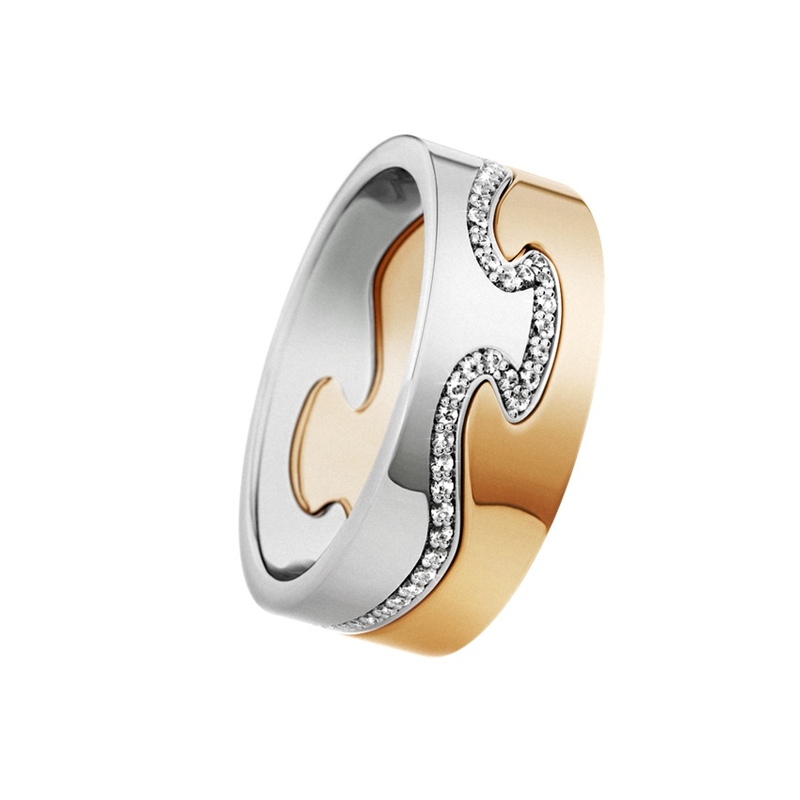 The original Georg Jensen Fusion ring was designed by Nina Koppel. Nina Koppel (1942 – 1990) studied textile design at Kunsthåndværkerskolen – Denmark’s School of Arts and Crafts in Copenhagen. She graduated in 1966 and during that same year, she established her own workshop where she collaborated with other artists specialising in design, clothing and soft furnishings. Nina Koppel began her collaboration with Georg Jensen in the 1980’s and her initial designs centered around Georg Jensen’s silver jewelry collections. In 1987, Nina Koppel designed the ring that eventually has resulted in the Fusion ring. What made the Fusion ring so special, was the ability of the wearer to design it according to her/his own taste. Red gold, yellow gold and white gold, with or without diamonds. This was a revolution in modern jewelry because it encouraged the wearer to take more of an active role in the design of his own jewelry. Nina Koppel was known for her ability to combine simplicity with mysticism in a beautiful way. 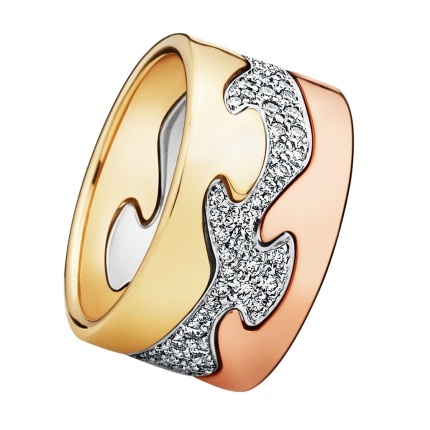 Her designs are intelligent; in the Fusion ring for example, each piece interlocks with the others seamlessly. Her talent did not come from a stranger, since her father was master silver craftsman and long time Georg Jensen collaborator Henning Koppel. Nina Koppel’s innovative work has been exhibited at several acclaimed venues including The Danish Museum of Decorative Art. The Fusion ring is composed of two extremities and a number of inside pieces, in white, yellow or red gold, with or without stones.The colors are inspired by the four seasons: the white gold evokes the white winter landscapes, the yellow gold brings the softness of summer sunshine to mind and the red gold is inspired by the changing colors of the leaves in autumn. The three colors naturally come together to form a harmonious ensemble, while the chosen elements are precisely measured to perfectly fit together. The most frequently chosen combination is two extremities and one central element. The Fusion ring is particularly appreciated as an engagement ring, as the two extremities, which form a band, can be later completed with a central element, with or without diamonds, on the wedding day. Further elements can later be added for other important events, such as the birth of a child. Fusion was designed as a unisex ring, and is perfectly suited to both women and men, depending on the chosen elements. 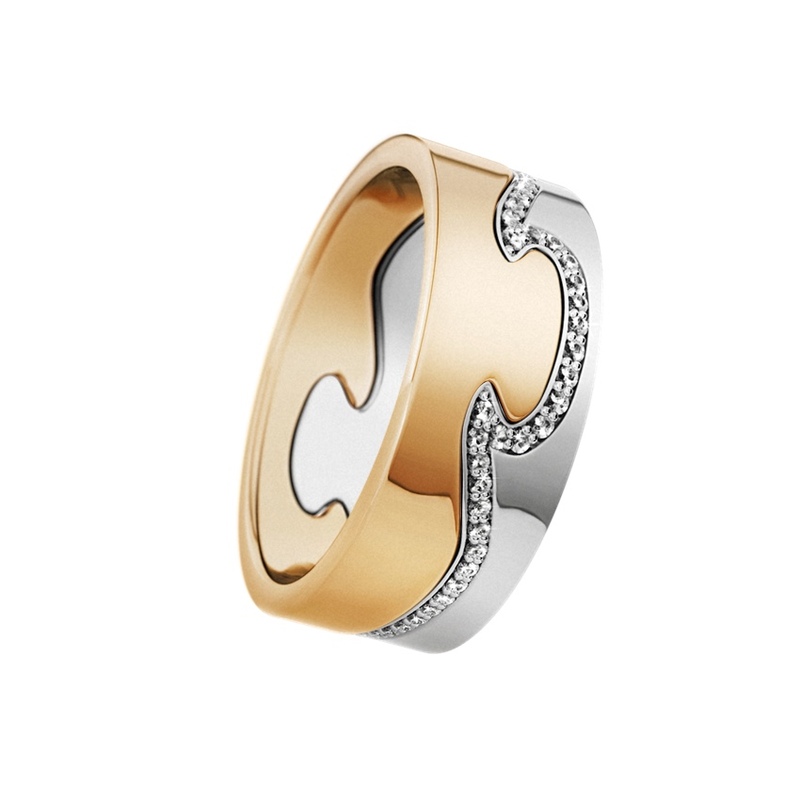 To help a future wearer visualising her/his favorite Fusion ring, Georg Jensen introduced the Fusion ring designer bar. Here you can play with the different available elements put together and see how the ring will look in the favorite combination of your choice. Below my own favorite version of the Georg Jensen Fusion ring, a yellow gold- and white gold outer element with brilliant cut diamonds. The design, with this specific pave set diamonds, is inspired by Nina Koppels original Fusion ring. The Fusion collection also includes exquisite bangles, cuffs, necklaces and earrings, all of which elegantly compliment the fully customisable Fusion rings, so you can wear the story of your love from your fingers and wrists to the tips of your ears. Fusion ring center pieces are currently available with colored stones, like blue- or pink sapphires, which would be the a perfect gift for the birth of a child. There are also center pieces with yellow sapphires, green tsavorites, cinnamon diamonds or black diamonds. And as Georg Jensen says it: Fusion is as intimate as it is expressive, because you’re the designer writing your individual story. The look is flowing, organic and utterly unique – not simply a another ring, but a whole new way of seeing, wearing and delighting in gold and diamonds. Fusion’s endless combination let you write your own love story. Come together with Fusion.